Flex Theme has an in-built slider widget. Using this slider widget, you can setup an image slider without using any external image slider plugin. Note: You can use any 3rd party WordPress plugin for the slider functionality. However, this may require additional changes or adjustments, not covered under the theme support. By default, theme includes basic styling for Genesis Responsive Slider plugin. 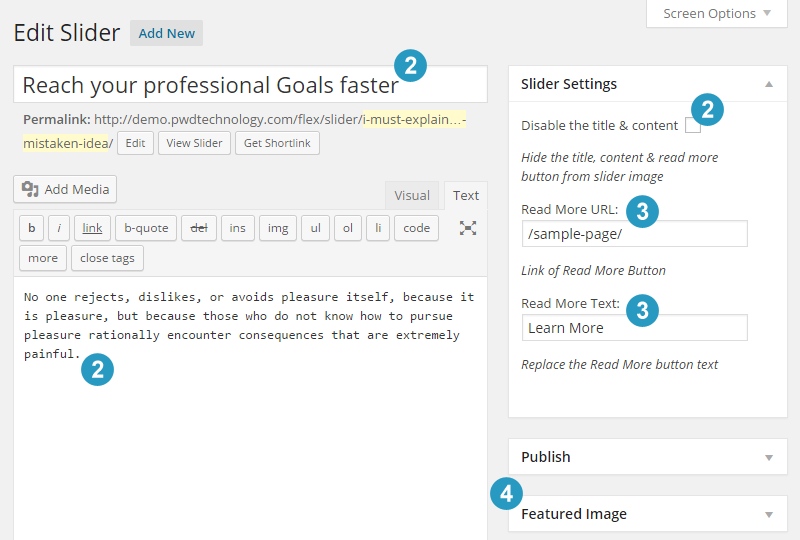 Slider has its own dedicated custom post type (cpt). Hence your slider data is neatly separated from the normal blog and pages content of the website. 1. 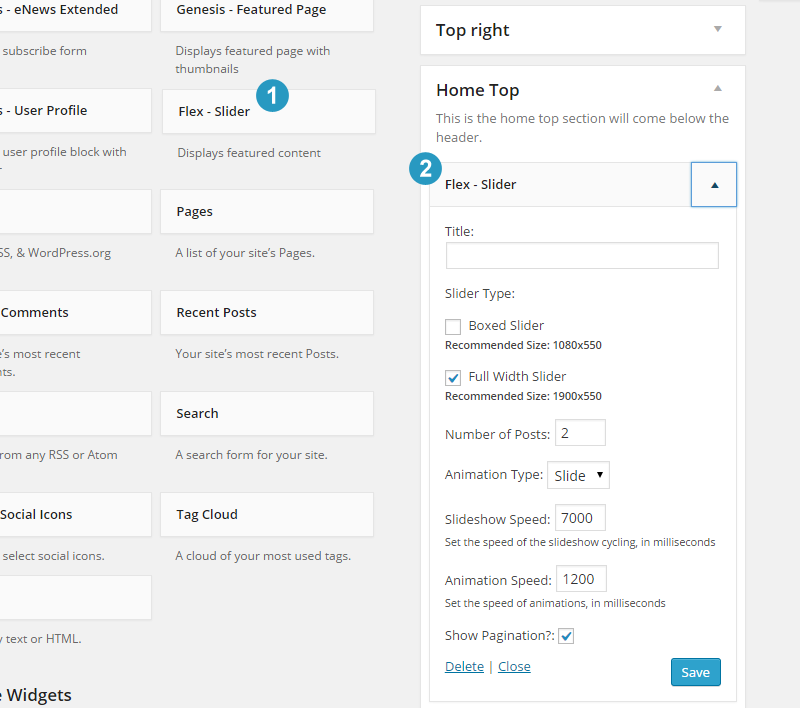 To enable Slider functionality, Login into WordPress Dashboard and go to Appearance > Customize. Expand the ‘Slider Enable / Disable’ and click to check (tick mark) ‘Enable Slider Feature’ option. 2. Now in the Dashboard, you should see a Slider option in the left panel. Go to Slider and click on the Add new button to add a new slide to be displayed in the slider. 3. Type the title and the content text. You can also hide the title and content text by selecting ‘Disable the title & content’ option. 4. Then type the Read More button text and it’s linking URL. This URL link can be any internal website (post or page) link or an external website link. 5. Click to expand the Featured Image section and then upload an image that should be displayed as background of this slide. 6. Repeat above steps to add more slides in the slider. 1. Go to Appearance > Widgets in WordPress Dashboard. Drag and drop Flex – Slider to a specific widget area. For example in the screenshot, flex-slider is added to the ‘home top’ widget area. 2. Flex Slider widget provide lot of customization options including: full width or boxed slider layout, number of slides, animation type, slideshow speed and animation speed. Configure them as per your specific requirements.